“The Treatment Action Campaign is outraged over what appears to be a covert and well-funded plan from the foreign pharmaceutical industry to delay an essential law reform process in South Africa. It takes us back to the turn of the century when 39 pharmaceutical companies took President Nelson Mandela and the South African government to court to try to stop legislative reform to improve South Africa’s ability to access affordable life-saving medicines. Now, just weeks after his death, foreign pharmaceutical companies are coordinating another major attack on this right. SECTION27 condemns the action taken by pharmaceutical companies to undermine the Draft Intellectual Property Policy process that is currently underway in South Africa. SECTION27, together with its partners has been calling for reforms to the IP regime in line with the constitutional right to health care services for many years. The DTI’s draft policy takes bold steps to address the negative consequences of the current patent regime for access to health care services, with its proposals to amend laws which act as a barrier to improved access to medicines in South Africa. The proposal by the US company Public Affairs Engagement (PAE), which is reported on in the Mail & Guardian today, shows that the pharmaceutical companies whose members make up the Innovative Pharmaceutical Association of South Africa (IPASA) are seeking to undermine the progress being made to protect public health through covert and anti-democratic actions, including buying ‘independent’ research from their R6m pot. The PAE proposal uncovers an agenda to interfere with a democratic legislative process in order to protect profits not only in South Africa but in the rest of the developing world as well as to “push back” against the civil society alliance of TAC, SECTION27 and MSF which has led on this issue in South Africa. It is critical that all progressive activists, academics, business, regional institutions and governments across the developed and developing world speak out against such underhanded tactics by these companies. SECTION27 is having discussions with our partners about the revelations and their implications and will issue a detailed statement early next week. 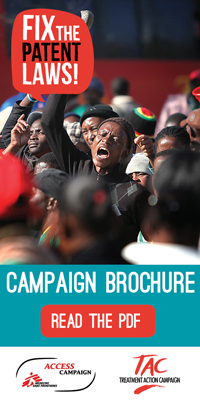 Please contact Umunyana Rugege on 011 356 4120 or via email to rugege@section27.org.za for comments. “To have foreign companies spending R6m to dissuade government from pushing legislation that promotes access to more affordable medicines is outrageous. The minister is right to take a firm stand against pharmaceutical companies that seek to protect their profit margins at the expense of ordinary South Africans. The government is bringing national law in line with international norms, so they have the ability to take action when inflated prices put crucial medicines out of reach,” said Julia Hill of Doctors Without Borders (MSF). 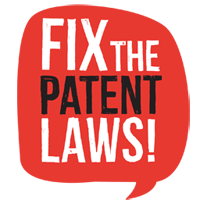 Reform of South Africa’s IP laws is long overdue. Today South Africa’s patent system already benefits international pharmaceutical companies by granting an excessive number of patents, compared to both developed and developing countries. South Africa remains a net importer of pharmaceutical products, to such an extent that it’s the 5th biggest contributor to our trade deficit. Changes to facilitate generic production would have a more positive economic benefit. “The draft IP policy includes reforms that are not radical. For instance, the proposed patent examination system would reward truly innovative patents and weed out frivolous applications,” said Hill. The Department of Trade and Industry (DTI) is responsible for finalising the IP policy, based on recommendations received during a public comment period on a draft policy late last year. The DTI has so far shown great fortitude in emphasising balance between interests of business and the government’s Constitutional obligation to protect public health. With the support of the Department of Health we trust the DTI will continue to withstand drug industry pressures, and make every effort to prioritise rapid finalisation of the IP policy, inclusive of public health safeguards.